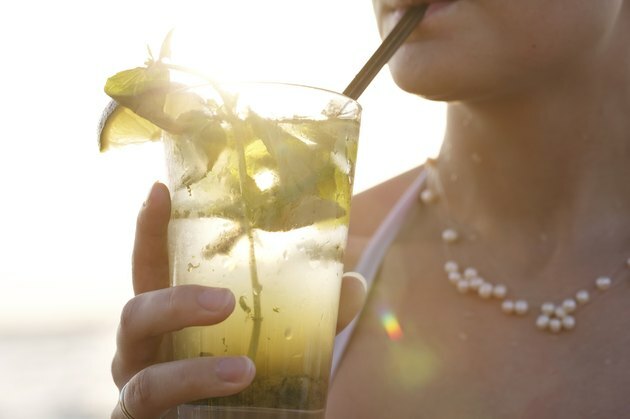 Lounging in the hot sun with a cool, alcoholic drink might seem relaxing, but it can be dangerous if you don't pay attention to what your body is telling you. If you drink alcohol outdoors on a hot day, avoid the sunlight and drink extra water frequently. Avoid getting intoxicated or you risk failing to realize that you're experiencing dangerous symptoms of dehydration or heatstroke. On a hot, sunny day, you are at risk of dehydration. As your body temperature increases, you start to sweat more because the evaporating perspiration will cool your body. If you drink enough water to replace what you lose through perspiration, you won't experience any problems. But alcohol not only fails to replenish your water stores, it dehydrates you further because it causes you to urinate and perspire more than normal. Symptoms of dehydration include thirst, a decreasing need to urinate, fatigue, dry mouth, dizziness, increased heart rate, rapid breathing and dry skin. You can treat mild dehydration by drinking more fluids. Moderate dehydration might require intravenous fluids to replenish your body. Severe dehydration can kill you, so immediate medical attention is necessary. If your body lacks fluids because of alcohol, it can't sweat to cool itself. If you are out in the hot sun, this can lead to heat stroke, a condition in which your temperature levels rise to dangerous levels. Symptoms of heat stroke include headache, dizziness, sluggishness, disorientation, confusion, loss of consciousness, hallucinations, seizure and other symptoms similar to those of dehydration. Immediate cooling and replenishment of fluids are necessary to prevent permanent damage or death. Expert medical attention is necessary in severe cases. If you become inebriated, you might not notice the effects of the sun, causing you to experience severe sunburn. Wearing sunscreen, lightweight clothes, a large floppy hat, and other items that limit your sun exposure might help, but the most effective approach is just to avoid drinking alcohol in the hot sun. Should I Stop Exercising With a Heat Rash?